In order to help enterprises in Beijing better understand taxation policy, “Beijing Investment Promotion Bureau”, “Beijing Municipal Taxi Service, State Administration of Taxation” and “Beijing Association of Enterprises with Foreign Investment” will co-hold “Interpretation Meeting on Taxation Policy”in Beijing in April 23th, 2019. We will invite leaders from Beijing Municipal Taxi Service, State Administration of Taxation to interpret taxation policy and answer the questions you mentioned in“Participation Receipt”(see the attachment 1) in the Interpretation Meeting. 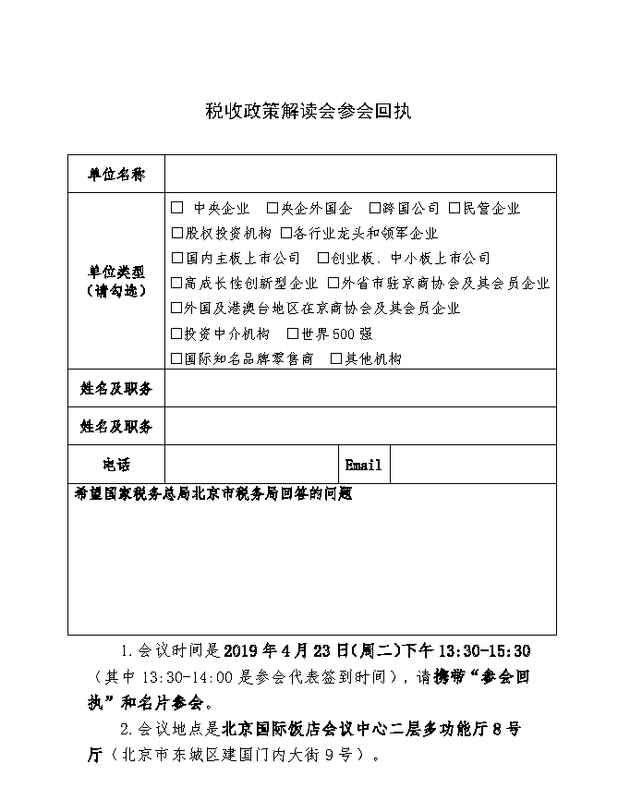 In order to ensure high-efficiency of the Interpretation Meeting, please submit in written form your questions (written in Chinese in Participation Receipt) which need to be answered by Beijing Municipal Taxi Service, State Administration of Taxation. Temporary questions will not be answered during the Interpretation Meeting. Arrangement of the Interpretation Meeting is as below. We sincerely invite you to participate in the Interpretation Meeting. If you accept our invitation, please fill in the Participation Receip, which should be sent to us before 2 o’clock PM in April 1st, 2019. We suggest you had better submit your Participation Receipt written in Chinese in the form of WORD, so that we can input your participation information in time. Please sign-in with your Participation Receipt and Name Card.